Mr Eporwei Edike, the Assistant Comptroller-General(ACG) of Customs Zone ’A’, made the request while hosting Rear Admiral Ferguson Bobai, the Flag Officer Commanding(FOC) Western Naval Command, who paid a courtesy visit to the ACG in Lagos. As both government bodies agreed on collaborating for better service to Nigeria, Edike said the navy was in better position of granting the assistance to ensure adequate monitoring and stoppage of the mid-stream discharge of cargo. He said that since the navy operates primarily on water it would be easier for them to go further into the sea where this act is mostly being perpetrated, and denying government revenue, even as there could be likely dangers of cargoes inimical to national security. Bobai said it was on the ground of the mandate given to the navy to support the operations of the customs at sea that informed the need for the support, in order that they deepen the already existing collaborative relationship between them. Edike, therefore, urged the FOC to make necessary arrests whenever his men on patrol observe any of such acts, because according to him ‘the customs alone cannot cover all the creeks effectively. “There is also a limit to which our boats can go in the cases of monitoring mid-stream discharge, but the navy’s boats can go further into the sea. Please when you see them during your patrols, arrest them. “Those ships will not report to Nigeria. They just stay out there and discharge into smaller vessels and leave through the creeks. 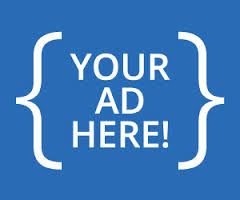 They are breaking our laws and therefore should be arrested,” Edike said. Talking about the contribution of the zone to the overall revenue collected by the customs service, the ACG told his visitor that the zone usually contributed three quarters of the total customs revenue. Edike said that since the restriction placed on 41 items over foreign exchange transaction also contributed in the dwindling revenue of the service, it now focused more on a number of excisable goods like cigarettes and alcohol. 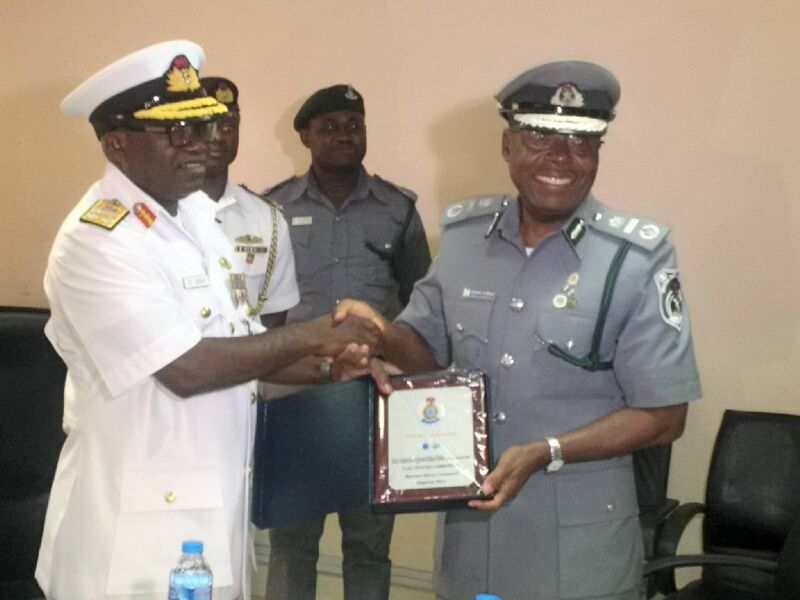 He said the efforts of the customs’ anti-smuggling operations in the bush and creeks had recorded successes with arrests of suspects and seizures of smuggled goods. Giving a breakdown, the ACG said that seizures made in the zone from January to April, comprised over 28,000 cartons of frozen poultry products, 20,778 bags of rice, and 3,686 cans of cooking oil. Other seized items are 50 bales of used clothes and 68 bales of cannabis, and the ACG disclosed that the items’ collective duty payable valuable stood at N1.3 billion. Rear Admiral Bobai used the occasion to inform the ACG of the forth-coming 60th anniversary celebration of the Nigerian Navy from May 18 to June 1. He said the navy would require the support of the customs in the course of its celebration, and hoped that they would get the support, while pledging the navy’s unrelenting support to the customs in the course of duty. 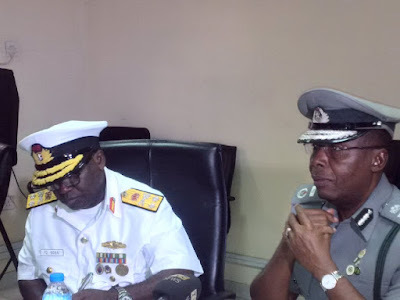 The FOC, Western Naval Command disclosed that the Nigerian Navy expects navies of over 10 countries, and that highlights of the celebration will include a sea exercise with the friendly nations coming with their ships. He said the navy had also built a tug boat at its shipyard in Port Harcourt, which will be commissioned on June 1, while they will set to also lunch about 50 other boats to be used for patrols in creeks in the areas the navy operate. Bobai disclosed that the navy’s planned commissioning of an offshore patrol vessel from China, and another locally-built one at the naval dockyard in Victoria Island would be shifted to a later date as time constraint would not allow the vessels to be ready for the date.